It's Wednesday (and the last one in July - OMG - how did that happen already?! ), so that means another Color Throwdown Challenge is on board! Broni is our hostess and I'm totally in LOVE with these awesome colors: raspberry, green and yellow! 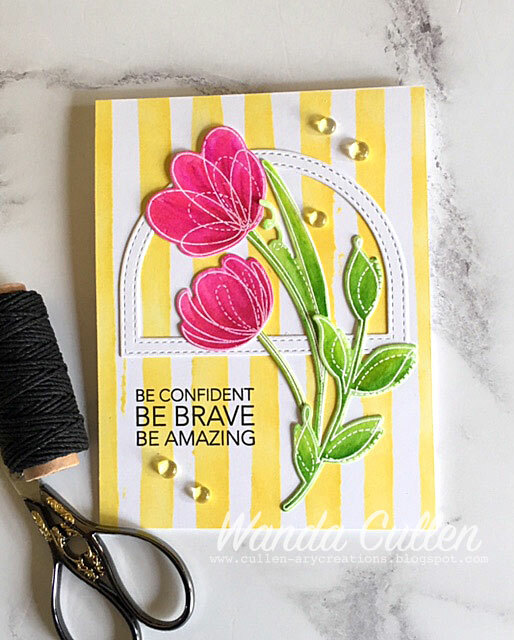 I'm loving this Watercolor Stripes Stencil by Altenew and created the background by blending Daffodil Delight ink (SU) with a Tim Holtz blending tool. Though I've had Simon Says Stamps' Spring Flowers stamp set for several months, I just recently got the Floral Shapes wafer dies. I white embossed the images on Ranger watercolor CS then colored them in using Zig Clean Color brush markers. Well, I should say I quickly scribbled in the colors since I knew I didn't have to stay inside the lines because I was die cutting them out. Easy peasy! The third new necessity - lol - was using one of MFT's Stitched Dome Frame Die-Namics. 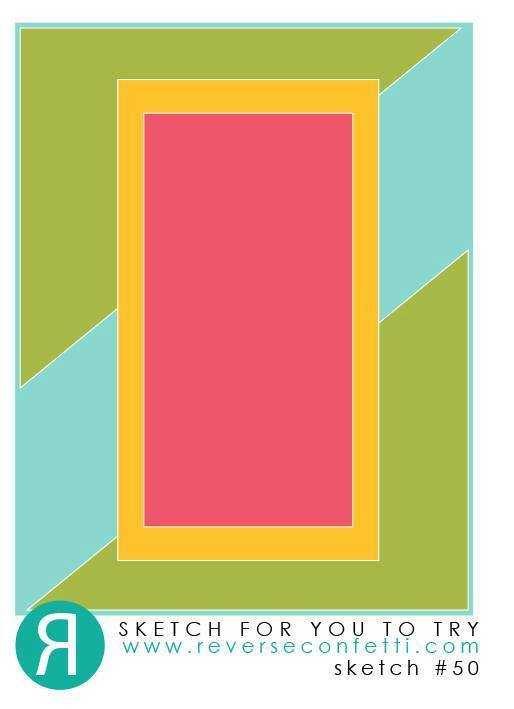 I love using open frames on my cards, so you'll be seeing a lot more of these in the future. The sentiment is from SSS Uplifting Thoughts. ZIGS: 202 Peach Pink, 025 Pink, 027 Dark Pink, 051 Lemon Yellow, 045 Pale Green, 041 Light Green, 047 May Green. Thanks to Tracey McNeely for joining us this month as a guest designer! Stay tuned next week to meet our August guestie! set and matching dies! He and his big sister are both into dinosaurs, so this was a no brainer when it came to card ideas. I colored with Copics after stamping with Memento Tuxedo Black ink on X-Press It Blending Card (my favorite with Copics!). The die cut images were then popped over some rolling hills and ombre paper for the sky in the background. I love personalizing cards, so had to include his name with MFT's Stitched Banner Alphabet Die-Namics! The inside of the card uses SU's Number of Years stamp set and says Look who is turning 1. Yes, I forgot to get a photo of the inside, so...insert sad face here! 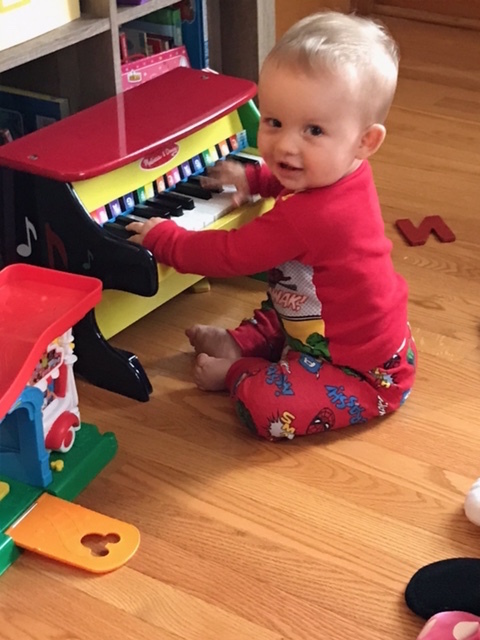 I can't close without posting a couple of recent photos of the birthday boy! He's adorable and very laid back... a shy guy - tucking his head and turning away when he first meets you! 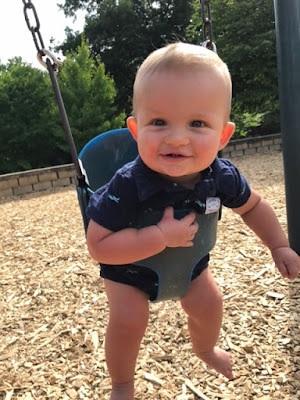 He loves to smile and has a very unique crawl that gets him everywhere! 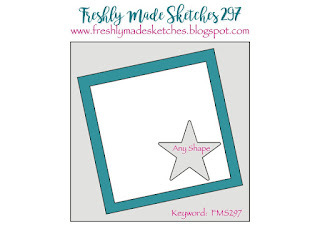 I love the tilted panel in the new Freshly Made Sketches challenge #297, but went with an A2 sized card instead of a square. I went with Reverse Confetti products again (can't seem to get my fill of them!) and mixed some old with some new! I just love the brushed lettering look with this new sentiment set! STAMPS: Sentiment Essentials, Build A Bunch (both by Reverse Confetti). PAPER: Coastal Cabana (SU), Kraft (PTI), X-Press It Blending Card, White (PTI). INK: Memento Tuxedo Black; Ocean Drive dye ink by WPlus9. DIES: Lacy Scallop and Swirlies Confetti Cuts. STAMPS: Build a Bunch and Posted Note Sentiments (Reverse Confetti). PAPER: Free Spirit 6x6 pad and Stone CS by Reverse Confetti; Black Licorice (MFT); White (PTI); X-Press It Blending Card. INK: Versamark; Memento Tuxedo Black. 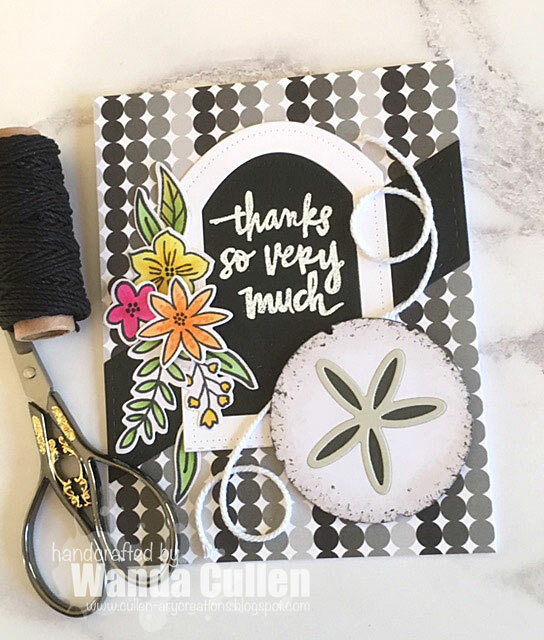 DIES: Sand dollar, Build a Bunch, Pierced Round Top Layers - all by Reverse Confetti; Stitched diagonal strip by Lil' Inker Designs. The florals were colored with Copics, die cut, then several flowers were popped with foam dots. I used a stipple tool to add some Lead ink (RC) to the edges of the sand dollar. Years ago, we visited friends at a beach cottage in Swansboro, NC and took the owner's small boat to a tiny island called Sand Dollar Hill. There were oodles of sand dollars everywhere and I remember being so surprised that their color is not initially white like you see in the souvenir shops - lol! Instead, it's a dirty brownish/gray color that is bleached out later by collectors. 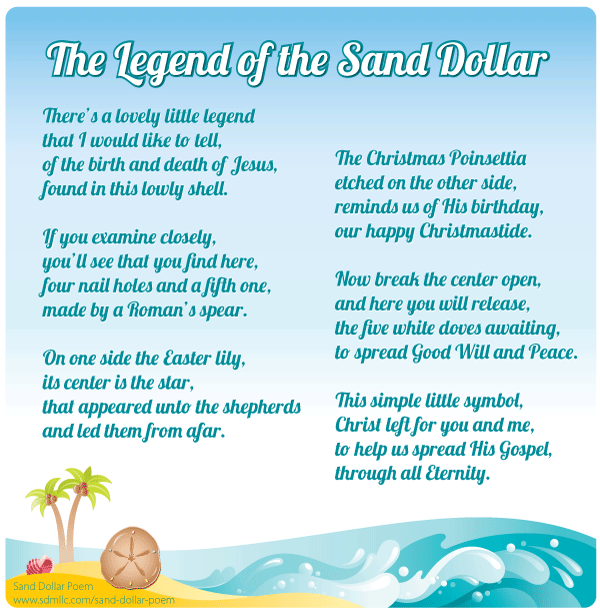 I also always loved the legend of the sand dollar and thought I'd share it with you here. Hey everyone! 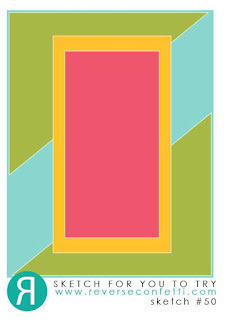 The new colors for this week's Color Throwdown Challenge are red, yellow, green and turquoise. 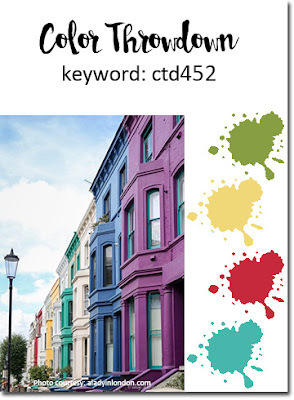 Barbara Anders is our hostess this week and was inspired by this street with a row of rainbow colored houses! 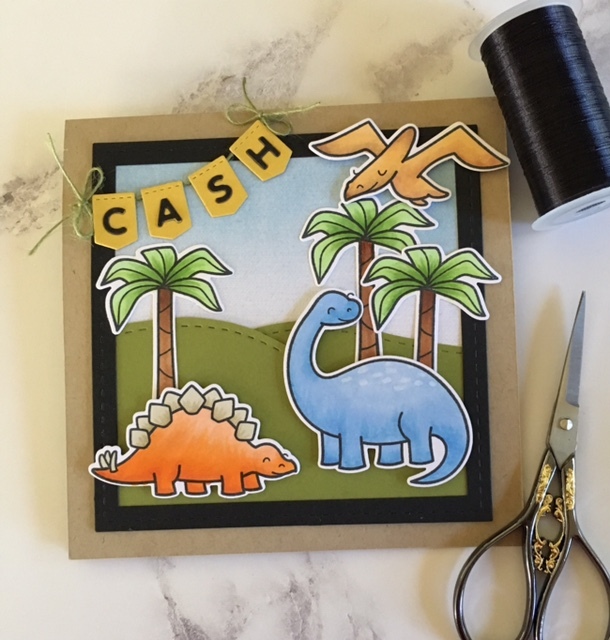 There were so many different ways I could have gone with the colors, but ultimately I chose some new goodies from Reverse Confetti's July release for this 5 inch square card. opposite corner. The tiny cross-stitched detail is from the Stitched dies by Paper Smooches. 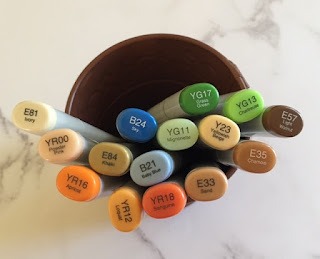 I colored the images with Copics after stamping with Memento Tuxedo Black ink on X-Press It Blending Card (my favorite paper for Copic coloring that doesn't smear!). The flower centers were highlighted with black Enamel Accents. 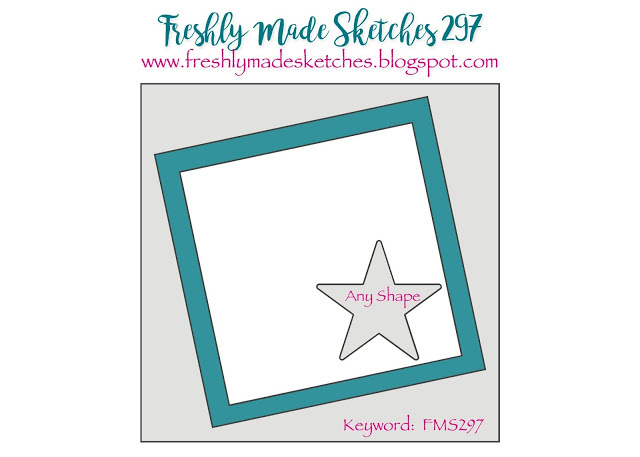 I'm loving the new layout by Donna Mikasa for the current CAS(E) This Sketch Challenge! 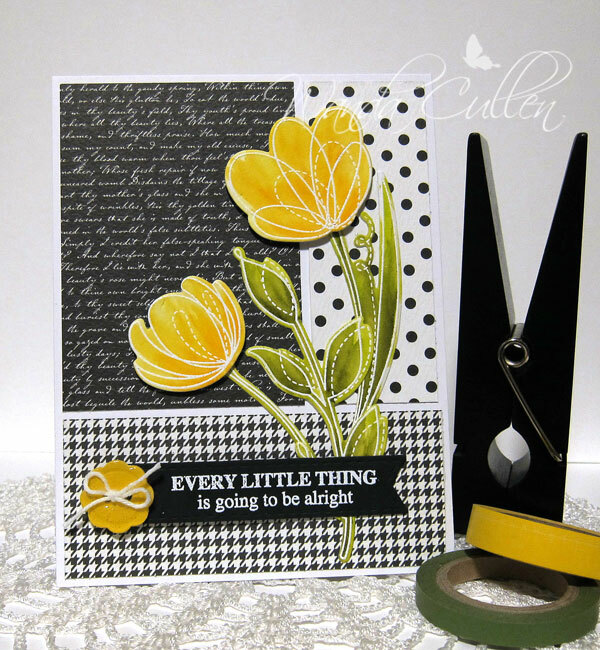 I wanted to pop a color against a trio of black patterned papers and went with a sunny yellow that will make you want to grab your shades! I didn't have a bright yellow button, so I went with a button die from MFT, layered up 3 cuts then added Glossy Accents over the top. This Spring Flowers stamp set by Simon Says Stamp is probably my current favorite set of florals! I love to emboss with white (Altenew Pure White Opaque EP) then color with Zig Clean Color brush markers! The matching dies (Floral Shapes wafer dies by SSS) make it so easy and you don't have to stay inside the lines since it's all die cut! 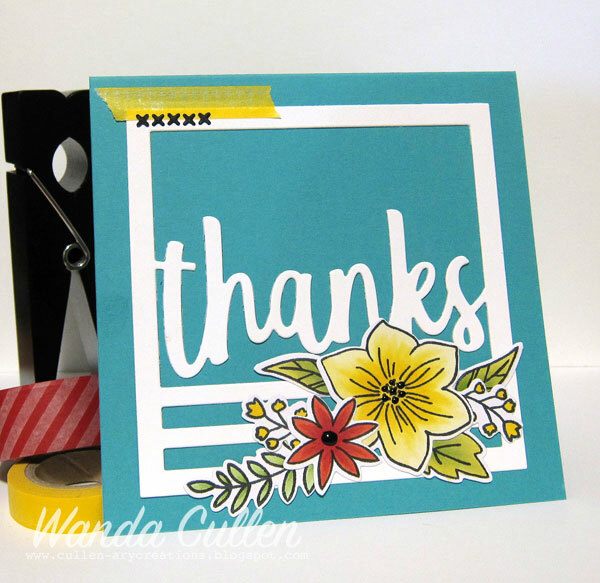 The sentiment is from SSS Uplifting Thoughts stamp set. 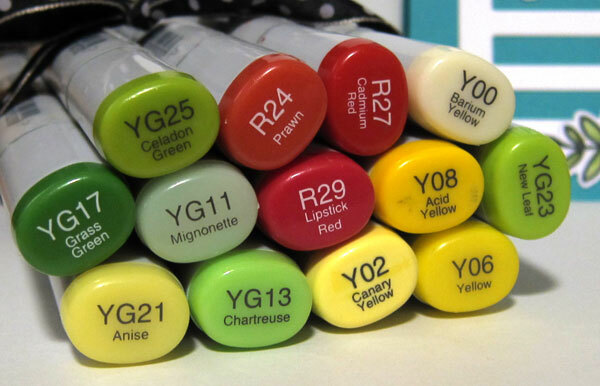 ZIGS: 051 Lemon Yellow, 050 Yellow, 052 Bright Yellow, 053 Yellow Green, 046 Mid Green, 043 Olive Green. PAPER: Bazzill 'Licorice' Basics Patterned Paper; Ranger watercolor cardstock; Yoyo Yellow (retired SU). Happy shopping (if you haven't already visited the Verve store)! 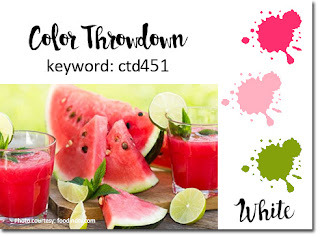 It's time for a new Color Throwdown Challenge and you are going to love these colors brought to us by Amy Rysavy - our hostess for this week! fun flamingo from Reverse Confetti's Fabulous Flamingo set. It was stamped with SU's Flirty Flamingo - which was just perfect for the pink tone. I added some tropical flowers from Reverse Confetti's Toucan of Friendship stamp set and colored them with Zig Clean Color brush markers. 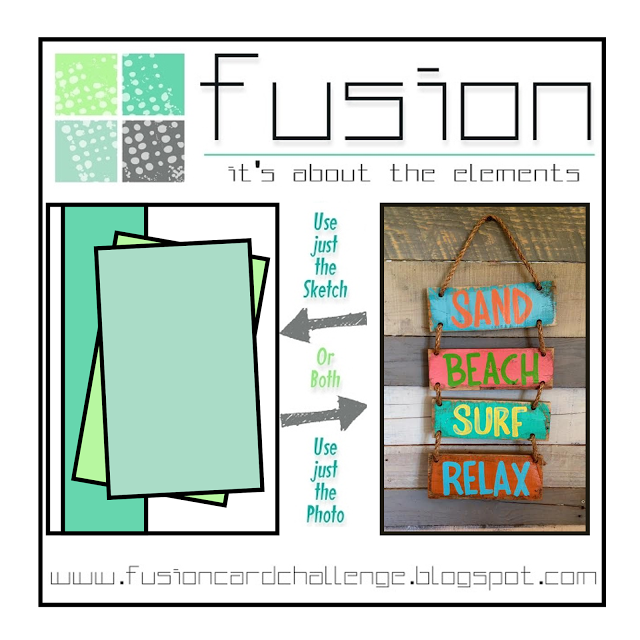 I'm using the fun sketch for the current Fusion Card Challenge (love those tilted panels!). Verve July Release Day is Here! Welcome back to Day 4 of Verve's July Release Spotlight Hops! It's an exciting day as there's new Verve in the store this morning! Three beautiful new sets and coordinating die sets just released and they're all available in the shop right now. To celebrate our new release, we're putting on another blog hop with a fabulous giveaway! Today's featured focus is designer's choice, so you might just sneak a peek at a whole bunch of must-haves! Here is another card I created using stamps from my favorite set of the release - Always Time! The Kettle Time dies were also used for perfect cutting. The sentiment and images were all white embossed with Altenew's Pure White opaque embossing powder then die cut and popped with foam tape. 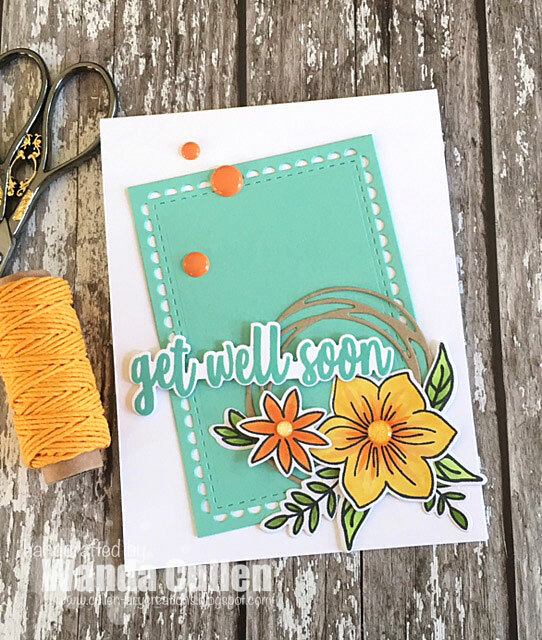 A couple of skewed patterned paper panels (Bazzill's Basics Patterned Paper) and some leafy dies in the background (Mariana vines by Poppystamps) made this a quick and easy card! You should have arrived here coming from Sheri's blog. If not, head back to the Verve blog to start at the beginning with Julee. From my blog, your next stop is with Charmaine. Welcome back to Day 3 of Verve's July Release Spotlight Hops! The Verve Divas and special guests are back for another day of spotlighting our new release! Everything previewed this week will be available to order in the Verve online shop on Monday, July 10. And if you just can't wait, you can pre-order our July Release Collection at a 25% discount through tonight. 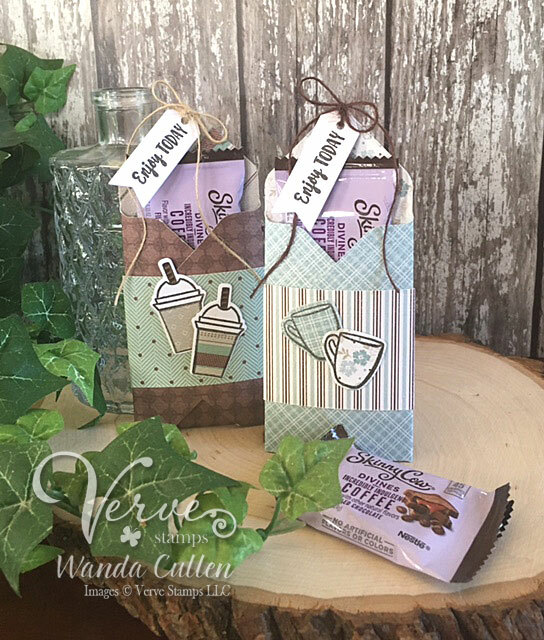 Today we're sharing our first projects featuring the Fill My Cup stamp set. This set also coordinates with the Happiness in a Cup Die Set we shared yesterday. Nothing says 'good morning' like a spirit of praise, some sunshine and coffee! 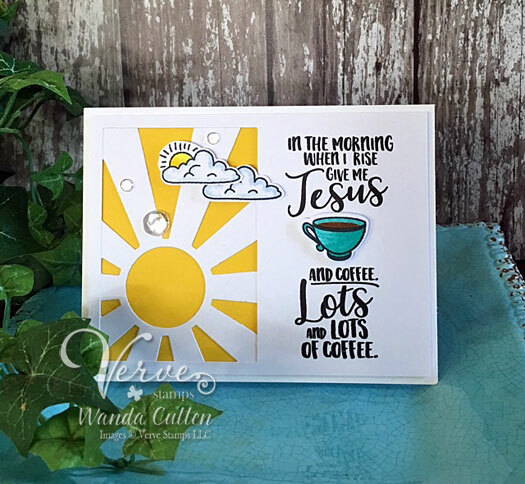 I knew right away I wanted to use some yellow cardstock with a sun ray die and paired it with a couple sentiments from the Fill My Cup set! I layered up a couple of the cloud images after coloring them with Zig Clean Color brush markers. For my second project, I wanted to make a couple of treat bags to give out as a random act of kindness with coworkers. Who doesn't want to arrive at work and find a little chocolate in their mailbox?! Using an envelope punch board, you start with a 5" square of designer paper and score the first corner at 2", next corner at 3", the next corner at 2" and the last corner at 3". Round all corners then fold in flaps with exception of the top corner. I added a 'belly band' of coordinating designer paper and decorated with paper pieced, die cut mug/cup images. I attached a tiny tag with twine. This is a great way to use up those scraps of patterned paper. Enabler alert: If you haven't tried these Skinny Cow chocolates with a coffee flavored caramel filling...you really must! You should have come to my blog after visiting Sheri. If not...you'll want to start at the beginning on the Verve blog and let Julee get you started. 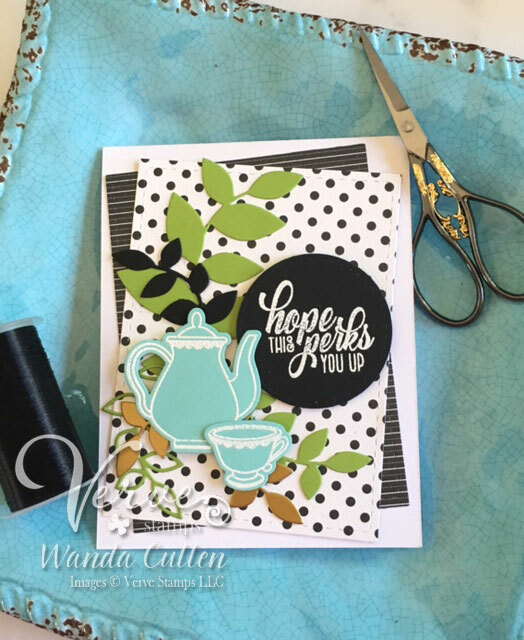 Your next stop on the blog hop is with Charmaine. 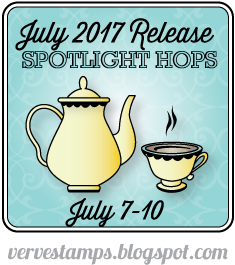 Welcome back to Day 2 of Verve's July Release Spotlight Hops! The Verve Divas and special guests are back for another day of spotlighting our new release! Everything previewed this week will be available to order in the Verve online shop on Monday, July 10. And if you just can't wait, you can pre-order our July Release Collection at a 25% discount through July 9! 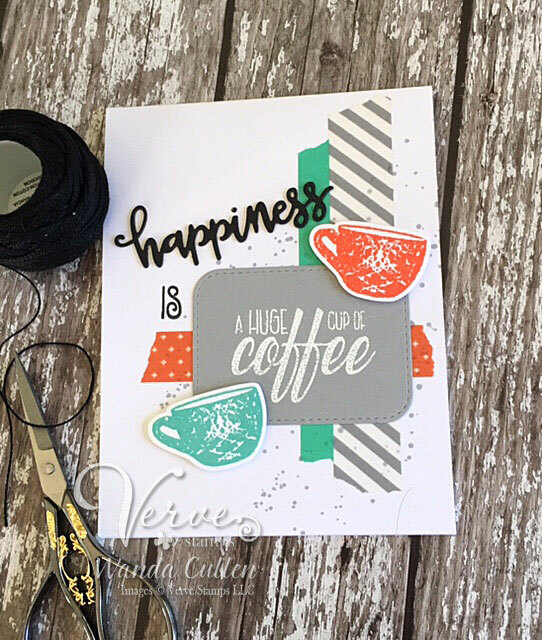 Today we're sharing our first projects featuring the Happiness Is stamp set and coordinating Happiness in a Cup Die Set. 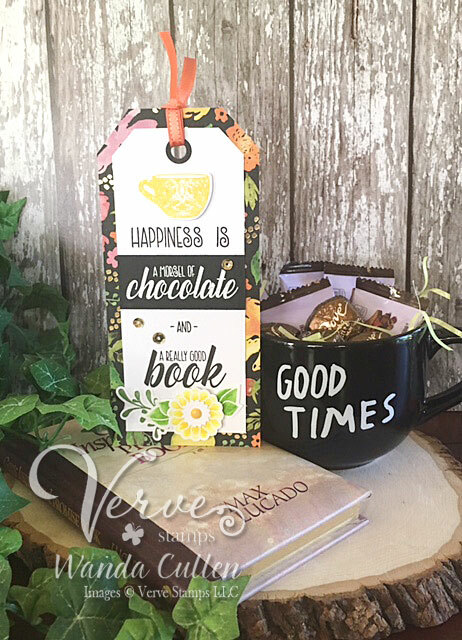 This set is not just for coffee lovers...it's got the chocolate and book lovers covered as well! I can think of many ways to incorporate these stamps with a gift tag, gift bag and in this case...a bookmark! Add a mug of coffee flavored chocolates and pair it with a book and you've got a great gift ensemble! I started with some foil patterned paper by Recollections for the base. The cup image was popped up with foam tape for added dimension. Some Verve florals - white embossed on watercolor cardstock so I could color with Zig Clean Color brush markers - were added to the bottom. A few gold sequins echo the gold foiling in the patterned paper. A clean and simple design that allowed me to use some of my neglected washi tape! I first splattered some gray ink (Smoky Slate) over the card base. I die cut three of the happiness sentiment to give it the look of chipboard. I separated the 'happiness is' sentiment stamp so I could pair 'is' with the happiness die. The cups were stamped with Ripe Persimmon distress ink and Ocean Drive Pure Color dye ink by WPlus9. 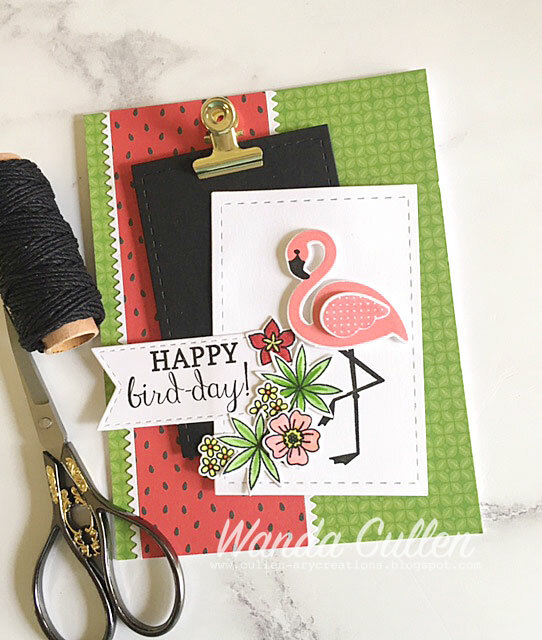 The matching dies make it so easy to have perfectly cut images to 'pop' on a card. You should have come to my blog after visiting Sheri. If you need to start at the beginning, head on over to the Verve blog so Julee can get you started. From here, you'll want to visit Charmaine and see what she has created!